The Burrows Engineering Racing team has unveiled a striking new livery for 2019 after joining forces with Richardson Kelly Racing. Dublin’s Derek Sheils will spearhead the team’s international road racing effort along with new signing Tom Weeden from Kent, who won the 2016 Senior Manx Grand Prix. The leading Northern Ireland road racing team will focus on the major international meetings, including the North West 200, Isle of Man TT, Ulster Grand Prix and Macau Grand Prix, in addition to a selection of Irish National events this year. Both Derek and Tom will return to the fonaCAB North West 200 in association with Nicholl Oils in May after missing the event in 2018. 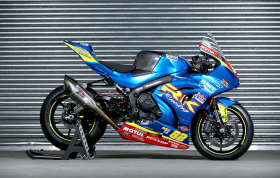 “We have a brand new look after joining forces with Richardson Kelly Racing and we are delighted to unveil our new livery for 2019. Everyone at Burrows Engineering Racing is looking forward to the start of the new season and we are hopeful of another successful year, with Derek Sheils coming back into the team on a full-time basis while Tom Weeden is a promising new addition to the team.